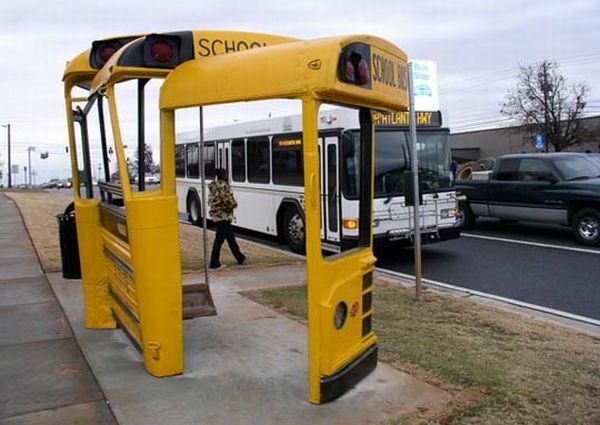 A School Bus – Transformed into a Bus Shelter! This recycled art installation in Athens, Georgia is at once ironic, humourous and functional – a bus transformed into a bus shelter. Sculptor Christopher Fennell created the shelter in 2007 out of three retired school buses dating from 1962, ’72 and ’77. Positioned on the corner of West Broad Street and Alps Road, the installation incorporates seating from a decommissioned Atlanta city bus. Full post: A School Bus – Transformed into a Bus Shelter!